Santa Claus' sleigh needs some serious speed to deliver toys to all the good boys and girls around the world on Christmas. Dodge is giving Old Saint Nick some help in a new ad by converting a Challenger SRT Hellcat Redeye into the ultimate toy-carrying conveyance. Forget Kris Kringle's usual chubby appearance, too, because the commercial casts the muscle-bound, former professional wrestler Bill Goldberg as Santa. At the beginning of the ad, Santa looks at his sleigh and proclaims, "I think my ride is due for an upgrade." 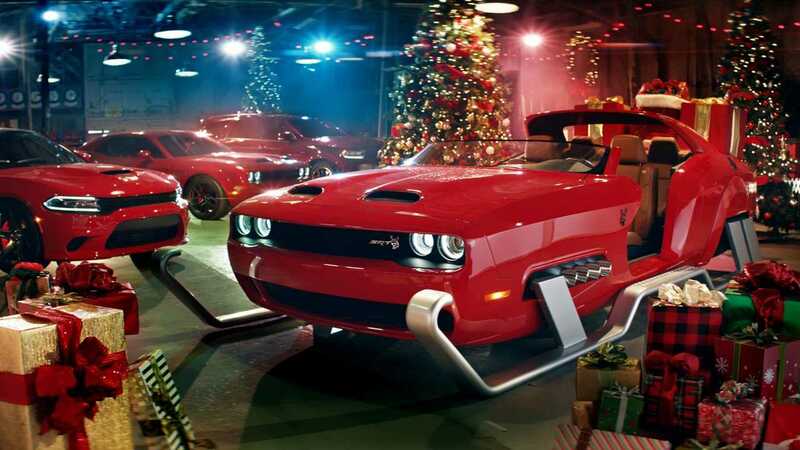 He and his elves then open a door to reveal Dodge's array of SRT performance models, including the Challenger, Charger, and Durango. After checking them out, they set to work to give Kris Kringle a supercharged toy hauler. The creation is a sliced up Challenger with a speedster-style, cut-down windshield and side-exit exhausts. Santa should be safe if anything goes wrong because there's a roll hoop in the back. There is also a new take on the Hellcat logo that puts antlers on the kitty. Think of it as a replacement for the reindeer. If you dig the antler-wearing Hellcat emblem, look for it on T-shirts coming soon to Dodge's online store. Dodge will use the ad to launch a marketing campaign around Goldberg's Santa as a brand spokesperson. In early December, look for posts on YouTube, Facebook, Twitter, and Instagram that highlight how the old-school sleigh becomes the Challenger-based beast. All Girls Garage host Cristy Lee will appear as Mrs. Claus in some of the clips. Santa Claus' sleigh needs some serious speed to deliver toys to all the good boys and girls around the world on Christmas. Dodge is giving Old Saint Nick some help in a new ad by converting a Challenger SRT Hellcat Red Eye into the ultimate toy-carrying conveyance. As an extension to the 30-second television commercial, the Dodge brand will launch a social series in early December that sends up popular car restoration reality shows. The social series, which will run across the brand's digital and social channels, including YouTube, Facebook, Twitter and Instagram, will chronicle the entire process of overhauling Santa’s sleigh, revealing the reasoning for many of the sleigh’s new features, and includes Dodge “personalities” Bill Goldberg (professional athlete, NFL player, pro wrestler and automobile aficionado) as Santa and “All Girls Garage” host and automotive enthusiast Cristy Lee as Mrs. Claus. The heavy metal track behind the spot “Santa Claus is Back in Town” is from the album "We Wish You a Metal Xmas and a Headbanging New Year." The song was first recorded by Elvis Presley for one of his holiday albums.